This is a non-traditional Spaghetti Carbonara recipe as it does not contain eggs (which can easily scramble) and has added mushrooms and ham. Traditional or not, it tastes fantastic and is easy to make. I recently read this article on freshly pressed, which, as great as it was talking about the first generation of people not knowing how to “use” the kitchen, in the opening paragraphs did little in the way of complimenting the humble spaghetti… I think the reason for this was twofold. Firstly, the author admits that her Mum used to cook so much of the only dish not-out-of-the-box she knew how, that the family was left having spaghetti leftovers for a week at a time. Admittedly, I used to be guilty of overcatering but Mr Chipconnoisseur has taught me this to be a big no no. Lunch the next day is ok, but dinner, lunch then dinner again not so much. Now I tend to agree: this is how people grow to dislike things. Secondly, I have found that for most people cream-based pasta sauces are more palatable than tomato-based ones (unless of course you are alergic to dairy) because they are less acidic and therefore less of an assault on the tastebuds. If you’ve ever tried making canned tuna spaghetti in tomato sauce and only liked it so so, try using cream instead – it works a treat and the finished dish is irresistibly good. Better still with a good pinch of curry. The reason why I love spaghetti? It is one of those meals that even the most hesitant cooks can master and prepare from scratch on any occasion. And when it comes to making this non-traditional version of the carbonara, the recipe doesn’t overcater and the dish feels light yet so deliciously creamy. The entire meal takes only minutes to cook, making it perfect for a midweek meal. 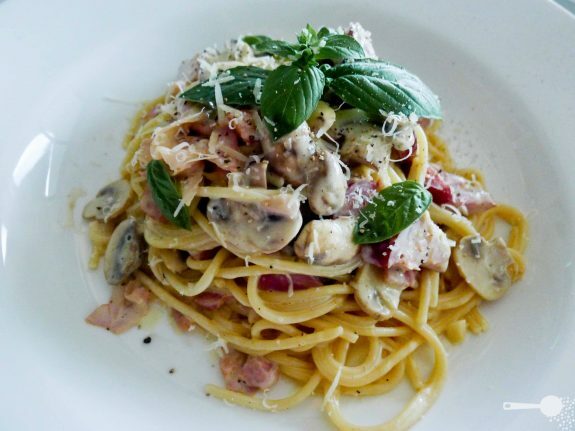 This is a non-traditional spaghetti carbonara recipe as it does not contain eggs and has added mushrooms and ham, but it tastes fantastic and is easy to make. Bring a pot of water to a boil, add half a teaspoon of salt. Add spaghetti and cook for 12 minutes (or according to your packet instructions). In the meantime, place ham into a medium saucepan over high heat and stir to brown lightly. Add mushrooms, pepper, garlic, a pinch of salt and mix well. Pour in cream, turn down heat and allow to cook down for about 10 minutes. Mix in a 2 tablespoons of finely grated pecorino or parmesan into the sauce. When ready, remove pasta with tongs and drop straight into the saucepan with the sauce. Mix well and serve immediately with extra cheese, pepper and basil leaves if you like. Where is the cream? 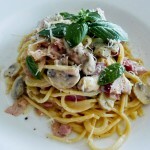 You cannot call this spaghetti alla carbonara if it has no cream in it! But, there is cream in it!!! Anyway, quite a nice blog you have here, some good suggestions around.